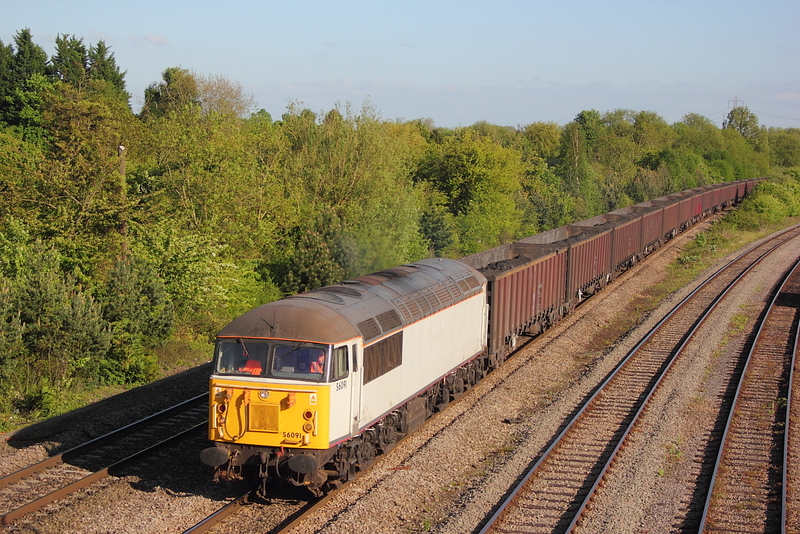 56303 6M06 Barrington to Willesden empties. 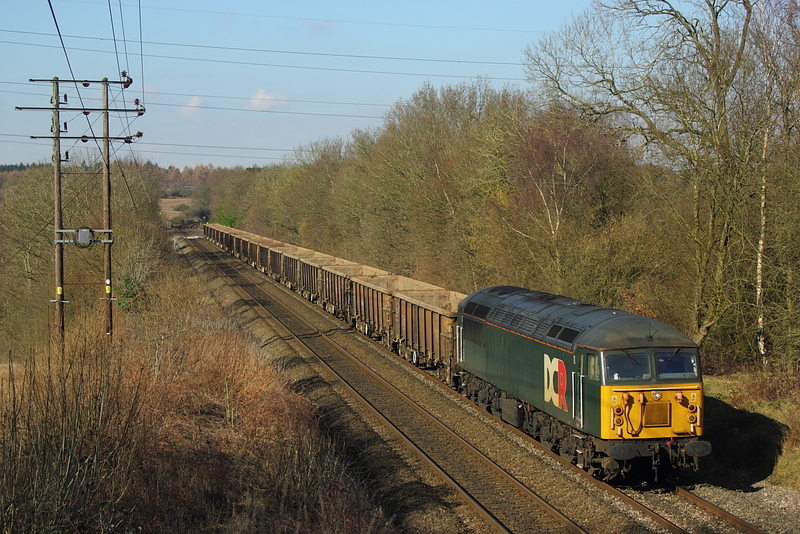 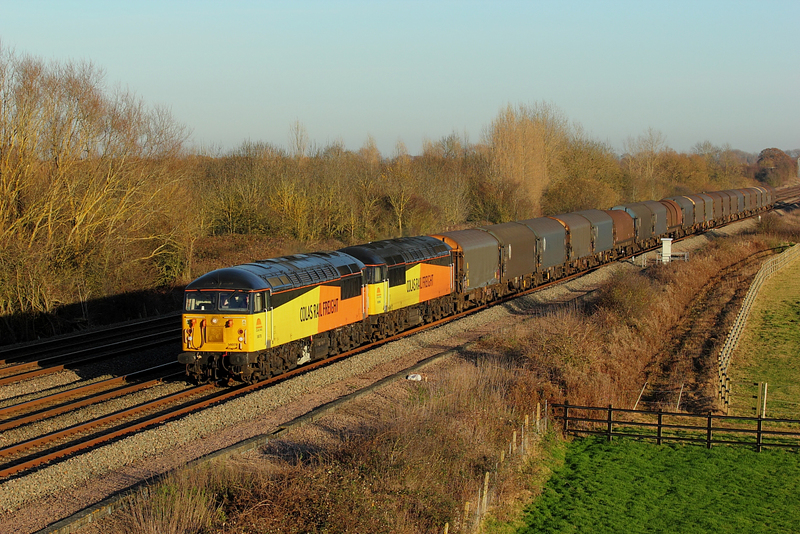 Nicked from RHTT duties for weekend engineering work,a filthy 56113 leads 56096 on 6C22 06.46 Filton Wood Jnct. 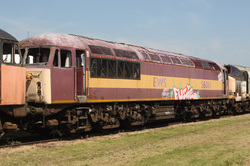 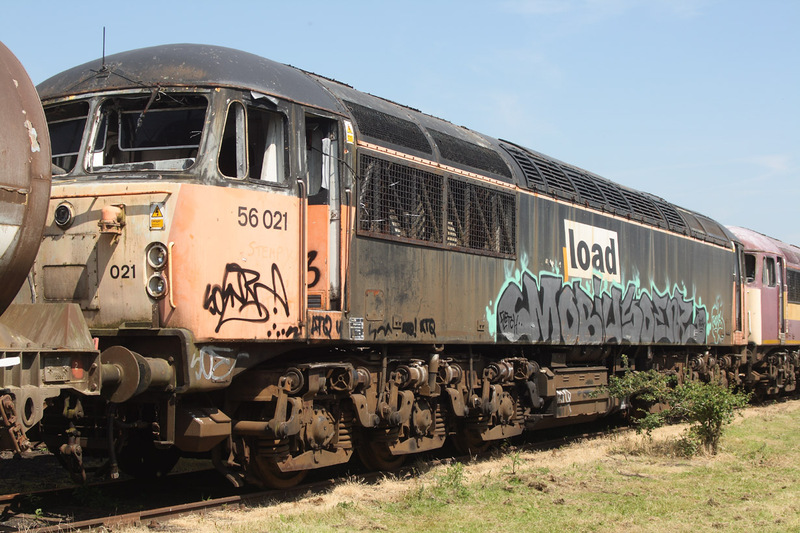 to Hinksey yard engineers. 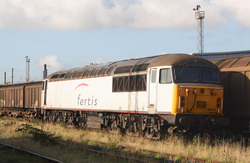 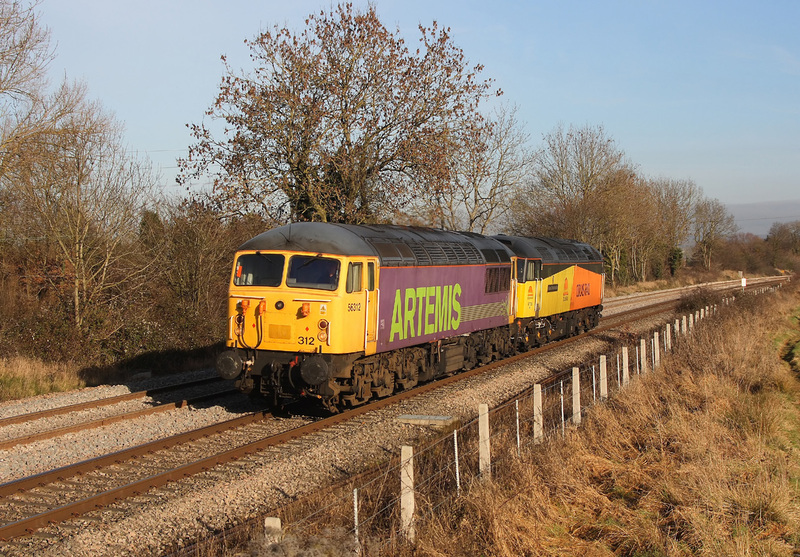 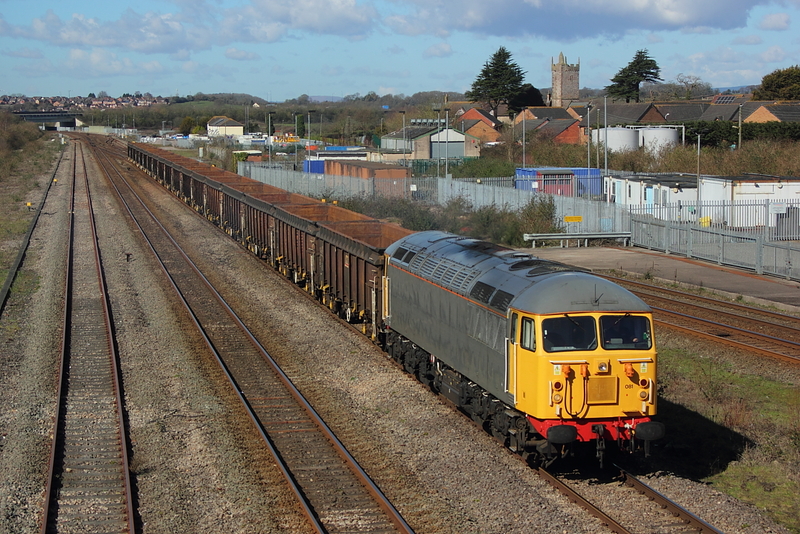 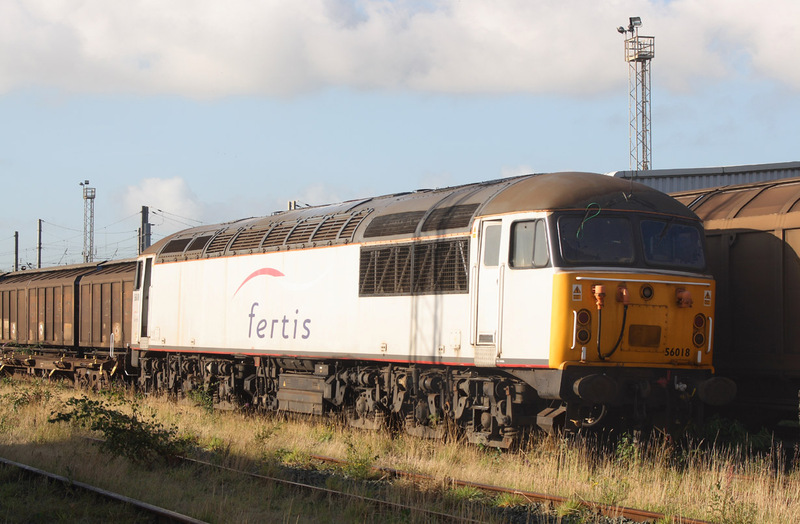 With a booked stop at Lydney it wasn't too hard to have another shot of 56312"Jerimiah Dixon"+ 56081 on 6Z34, however the sun wasn't going to play ball this time as the grids passed Badgeworth with the empty scrap wagons from Cardiff Tidal to Leicester L.I.P. 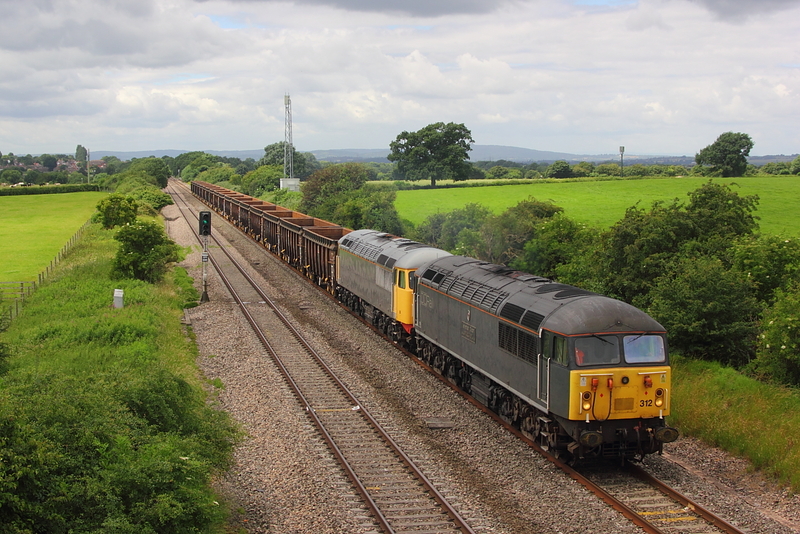 With the sun somehow managing to peer through a mainly cloudy sky,56312"Jerimiah Dixon-Son of County Durham Surveyor of the Mason -Dixon Line USA"+ 56081 pass Undy with 6Z34 Cardiff Tidal to Leicester L.I.P. 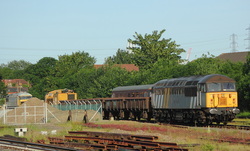 with empty scrap wagons. 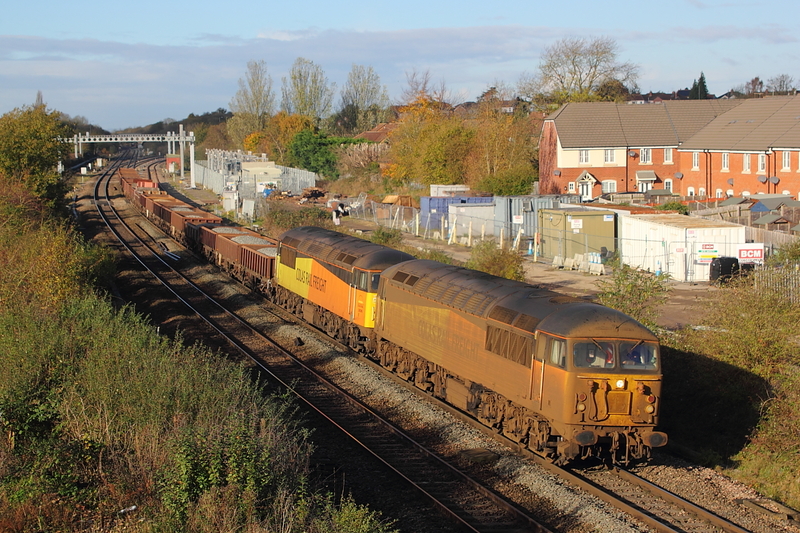 56081 6Z34 09.46 Cardiff Tidal to Chaddesden empty scrap box wagons. 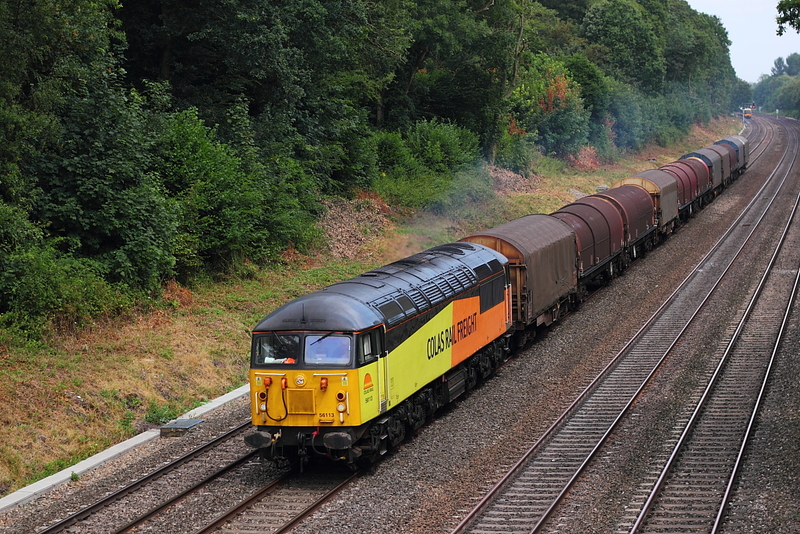 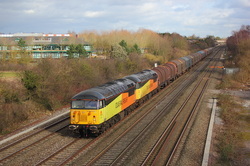 56081 6Z34 09.46 Cardiff Tidal to Chaddesden sidings trundles along the relief with returning empty scrap box wagons. 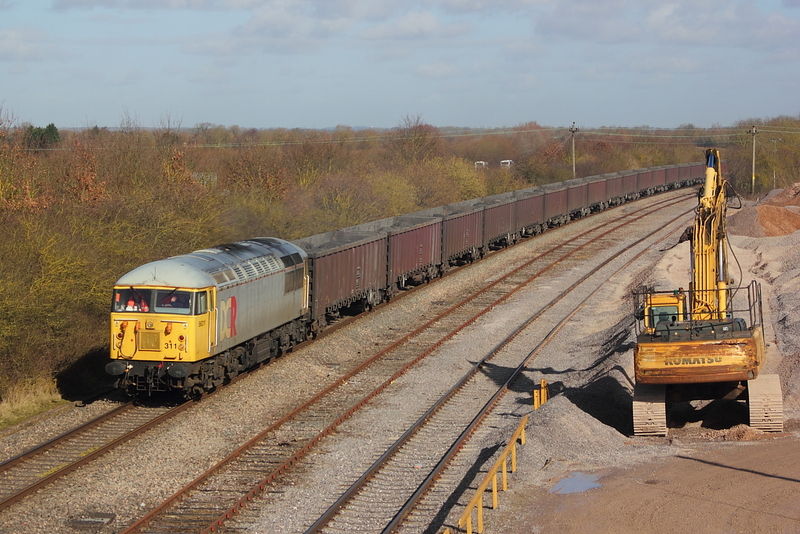 56081 6Z34 09.46 Cardiff Tidal to Chaddesden sidings conveying empty scrap wagons. 56103 6Z57 Calvert to Willesden Euro-Terminal empties. 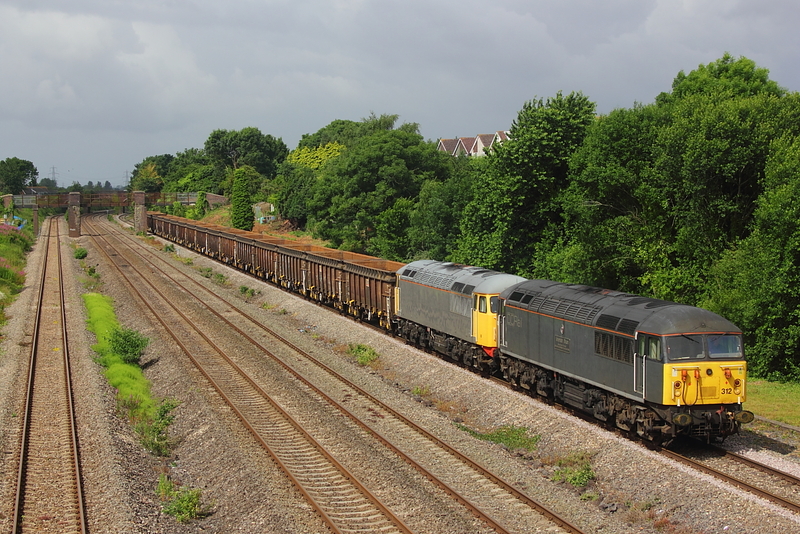 Typical.....with the Chaddesden to Cardiff Tidal scrap seemingly taking a lifetime just to get here from Derby,a more cloudy period coincided with 56081 finnaly passing on 6Z35,and it was only a telephoto shot that salvaged something out of the situation. 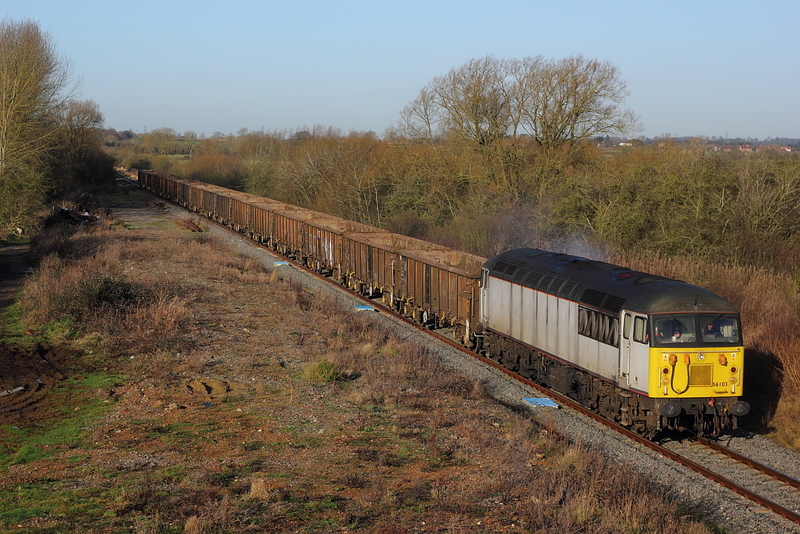 56081 6z35 Chaddesden to Cardiff Tidal loaded scrap. 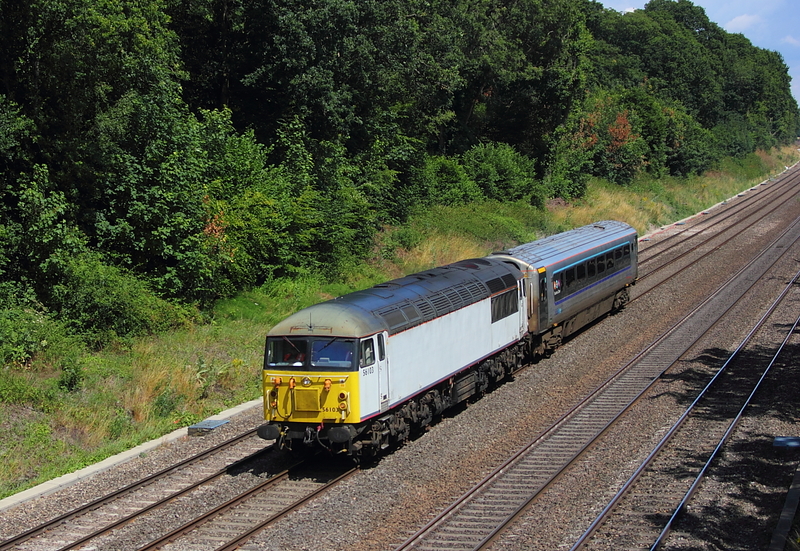 56103+Chiltern Railways coach pass on 5Z35 12.48 Wembley Lmd to Bristol Barton Hill W.R.D. ,unlike the earlier up morning shot,this time the sun played ball. 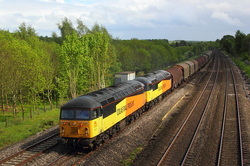 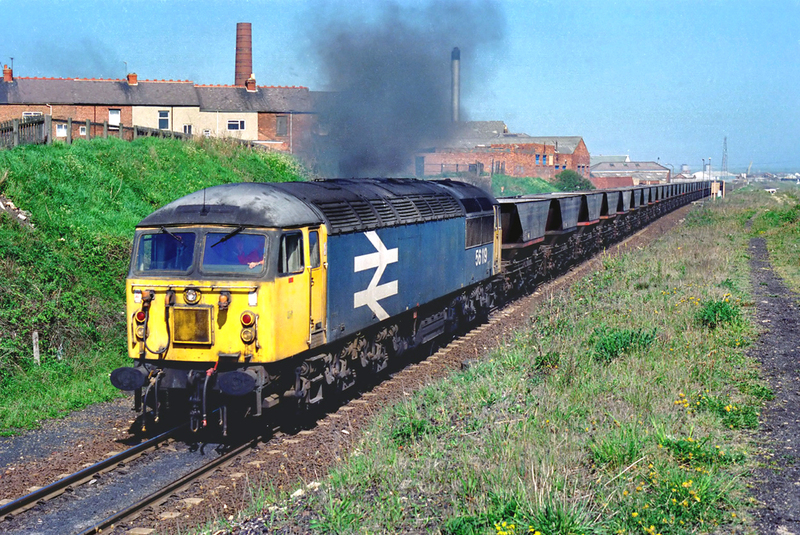 56104+Railvac 6y56 Butterley M.R.C. 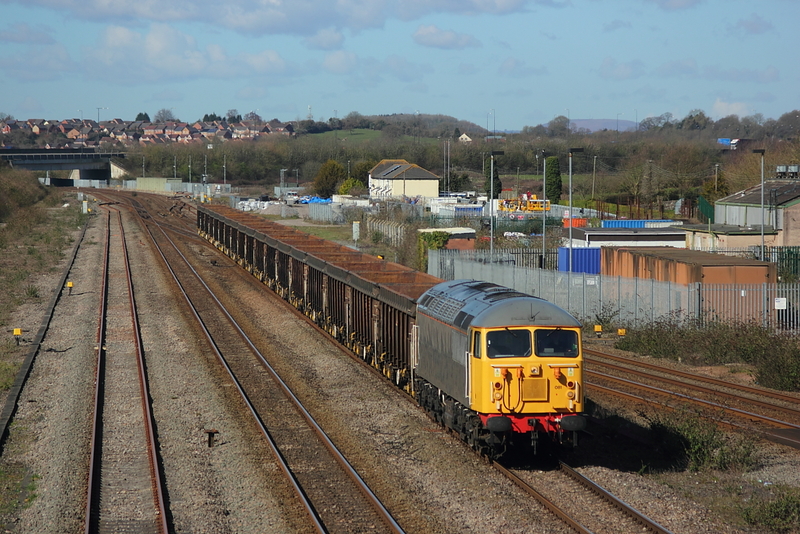 to Totton yard. 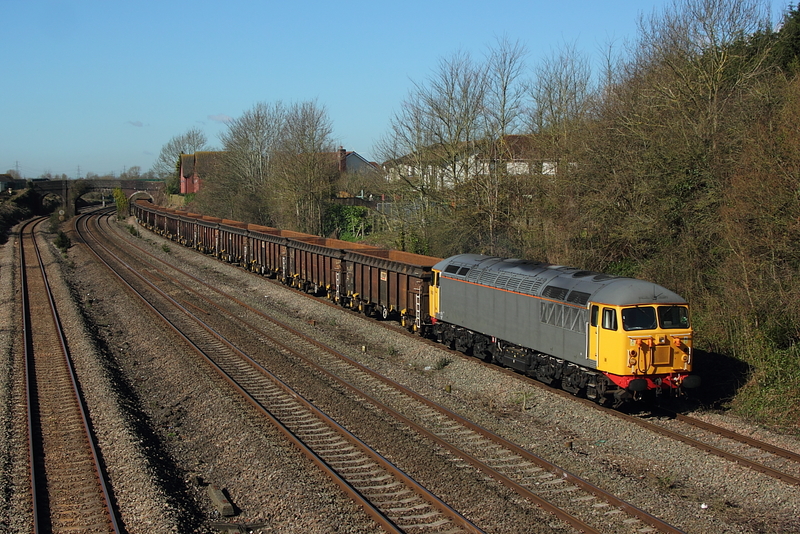 Well ,finally nailed a SUNNY Grid on 6V62(well two to be precise),just in time I may had ,has 60021 was back in action on the following Wednesday turn.So 56078+56096 pass the eagerly awaiting gallery at Denchworth with the Saturday Tilbury to Llanwern steel empties. This sodding working,(6V62 Tilbury to Llanwern ),particulary with a Grid involved, has somehow managed to pass by me,in everything,other than sunlight through all my attempts this year,and with the Colas tugs taking over this turn,its been some time since a Grid has appeared,however 56087 did the honours today passing White Waltham, probably under the only narrow band of cloud in the south of England,and driving a few miles towards home,this itself deciding to suddenly break up,another kick in the teeth. 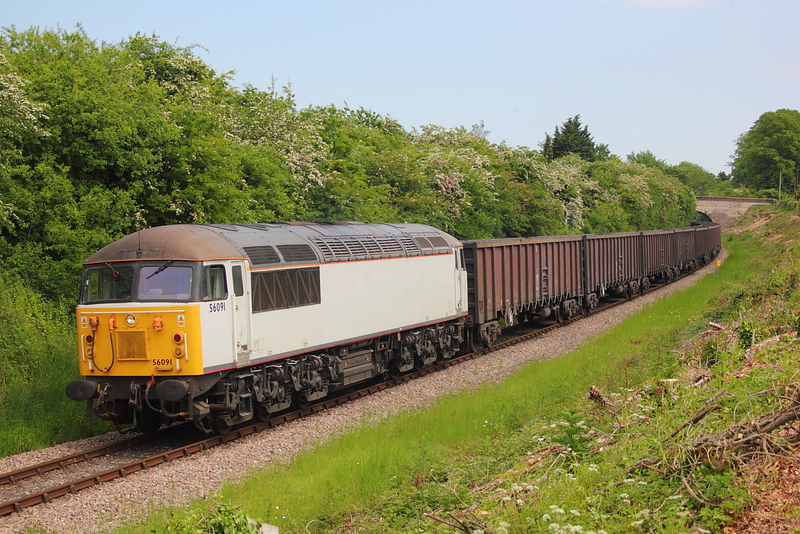 If one working in the sun has eluded me ,its this one,and again another failed attempt as 56113 passes on 6V62 Tilbury to Llanwern steel empties. 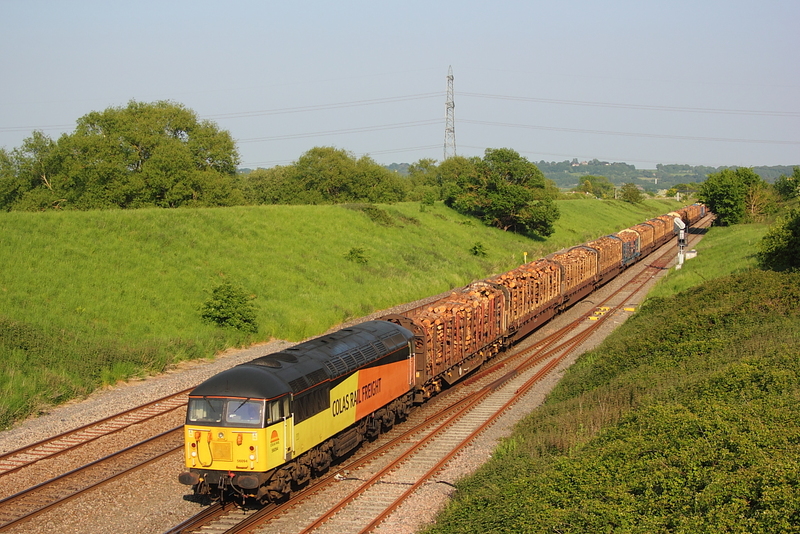 With a late running unit on 1W18,holding 6M51 at Newport,then loosing out in the pecking order to the 67 on the Holyhead service 56113 finally turned up 28 Min Late on the Baglan Bay to Chirk loaded logs but thankfully still in superb evening conditions. 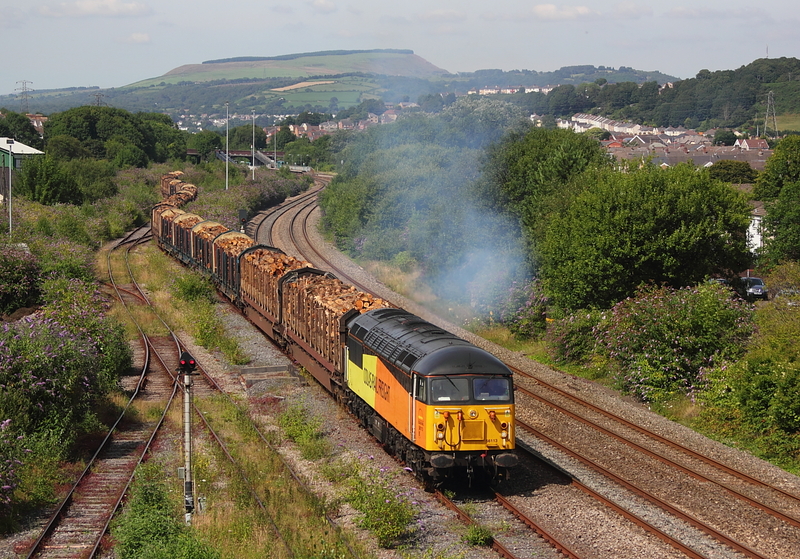 56113..6M51 Baglan Bay to Chirk Kronospan loaded logs. 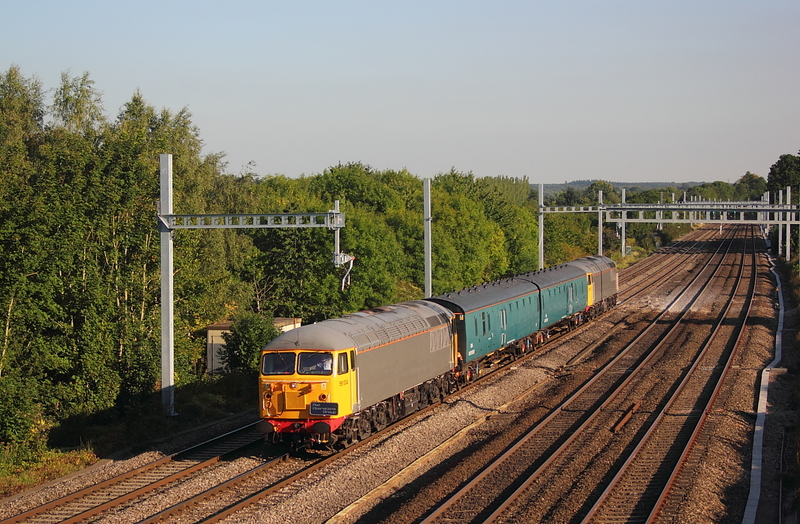 Still in its previous Fastline ownership colours,56310 powers passed Micheldever station on a Sunday 6Z41,07.15 Kew Bridge to Totton yard Railvac move with 56311 on the rear. 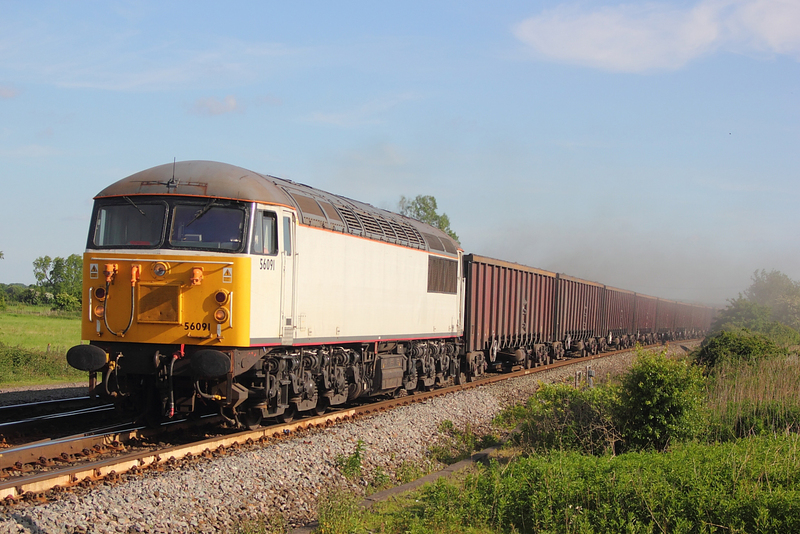 Running over 2hrs late at Lower Basildon,Colas Grids,56113+56078 power past with 6V62 Tilbury to Llanwern empty steel wagons,in the very last gasp of sunlight during a rare sunny period after a not so rare downpour,IF ONLY,it kept its time (abeit being well late anyway),then I could have had a full blingo,but on the flipside being late allowed a sun on the nose job as apposed to being totally on time. 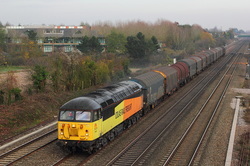 With the signal problems in the Maidenhead area,still ongoing due to lineside equipment being flooded at Shottesbrooke,all workings were going slowly between a section of signals on Red ,before getting the go ahead to proceed each one and 56113+56094 on 6V62 Tilbury to Llanwern was likewise,seen here passing White Waltham in the very last bit of brightness before the shower clouds approached. 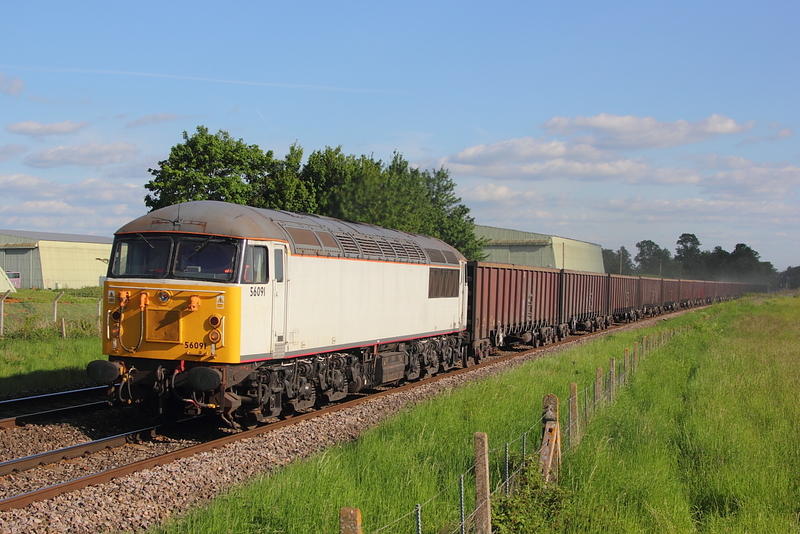 On arrival at Islip, it was just on the edge of the forcasted band of cloud/showers affecting the M4 corridor,with the sun always close to the crap and minutes before 56091 appeared on 6Z91 Calvert to Didcot P.S. flyash empties,my sodding luck ran out and it passed in a bright but not sunny period,and then on the way back it was full crap so I shouldn't moan I suppose.As a matter of interest,the position of the grid will be the area where a new road overbridge will be built,replacing the nearby Mill Lane crossing. 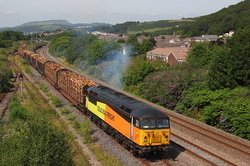 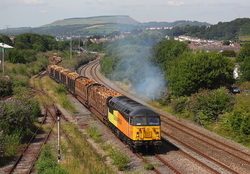 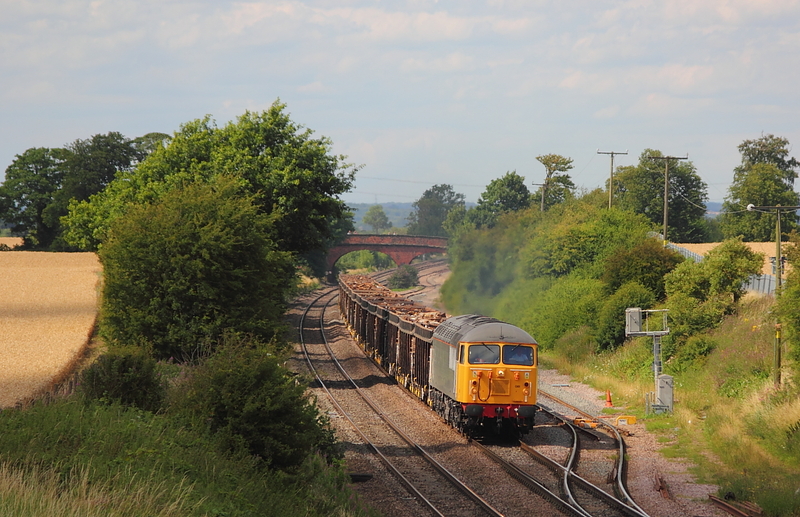 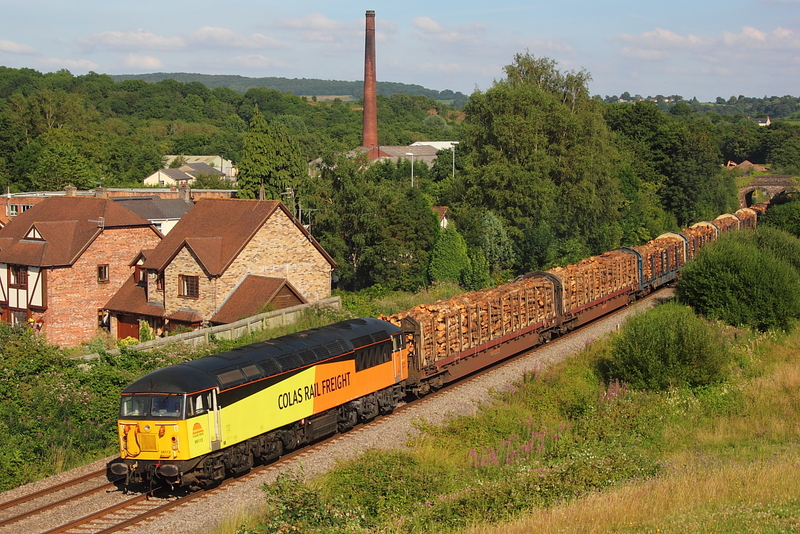 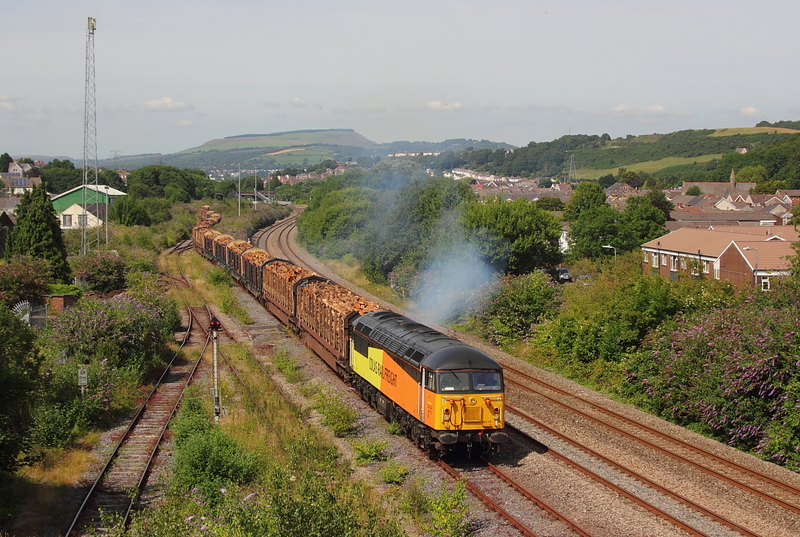 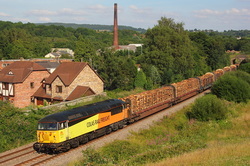 56094..6Z52 Teigngrace to Chirk Kronospan loaded logs. Having been standing in constant sunshine for 90minutes awaiting the Didcot P.S. 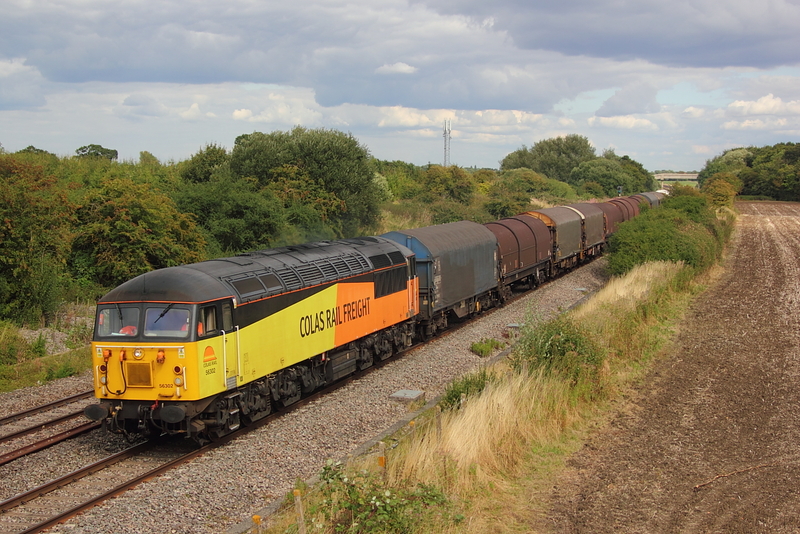 to Calvert flyash working,a rogue cloud decided to **** things up somewhat and has 56091 on 6Z92 appeared it was only good luck that a gap appeared allowing sun on the subject . 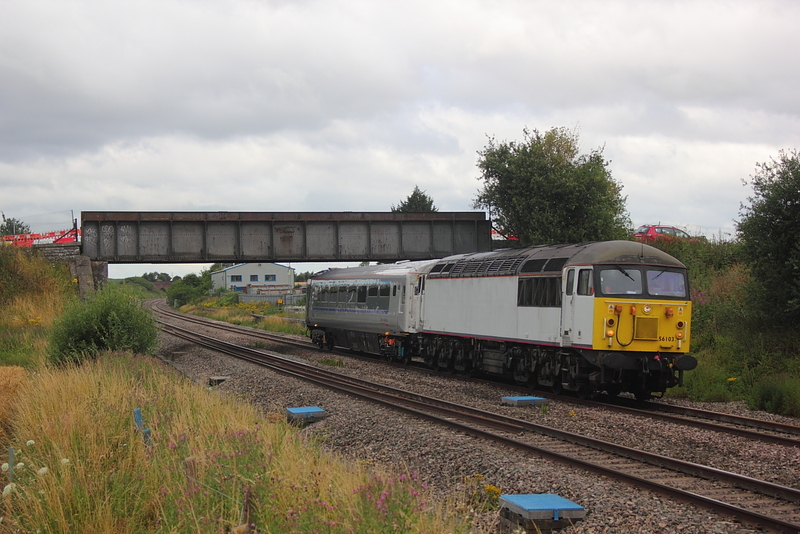 DCR's 56303 passes on 6Z91 Calvert to Didcot P.S. flyash empties. 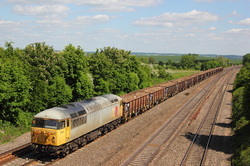 56311 passes Banbury Road stone terminal with 6Z91 Calvert to Didcot P.S. 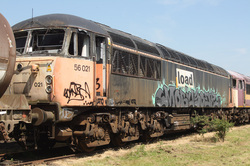 Flyash empties. Still in its Fastline livery,56301 departs Swanage station with 31103 "Swordfish" On 1N32,14.30 to Norden. 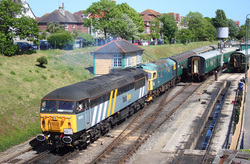 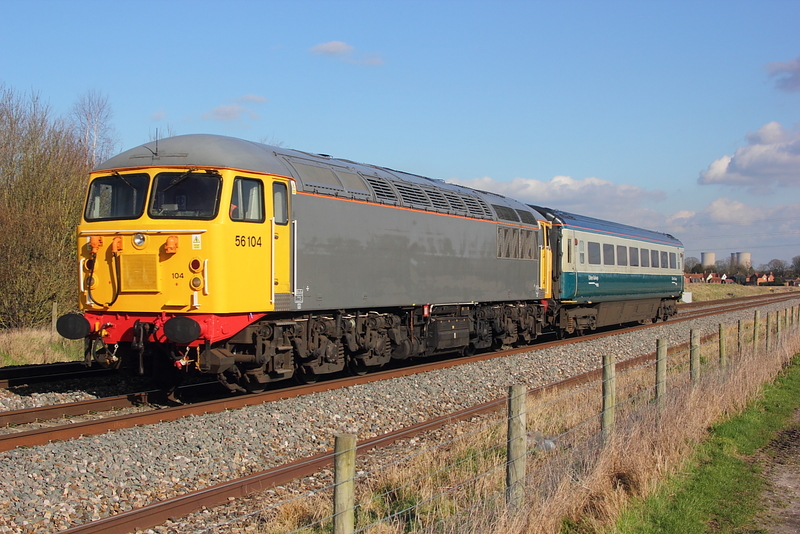 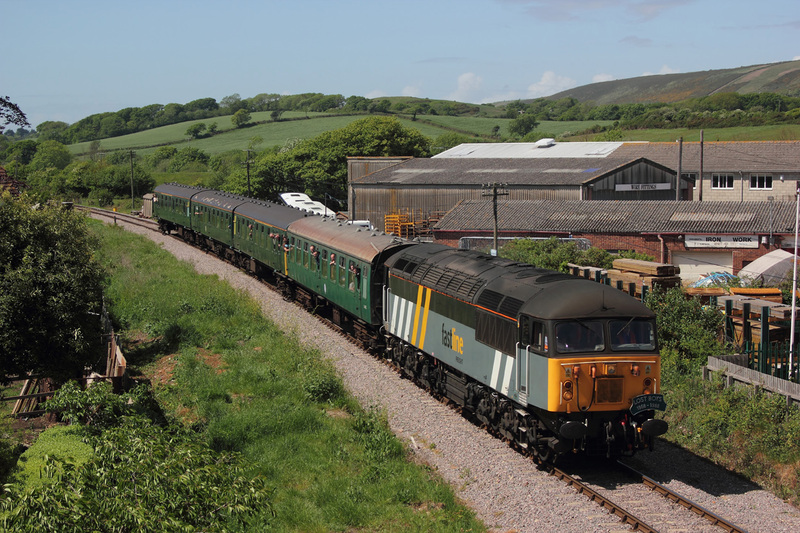 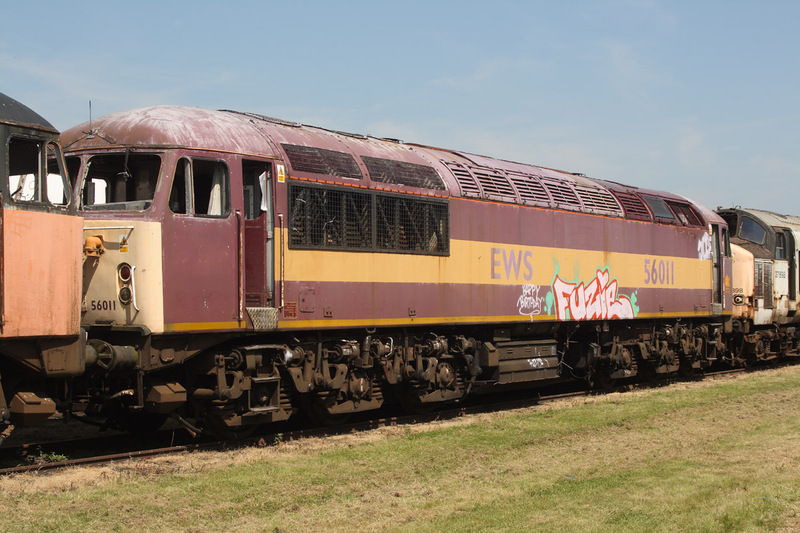 08/05/11 Swanage Railways Diesel Gala. 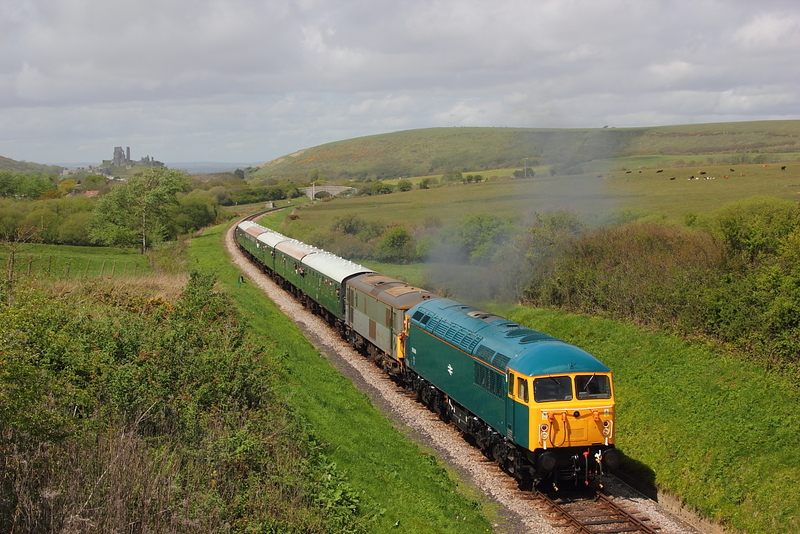 Still wearing its previous owners Fastline livery,56301 approaches the outskirts of Swanage with 1S11, THE 13.10 Norden to Swanage Service. 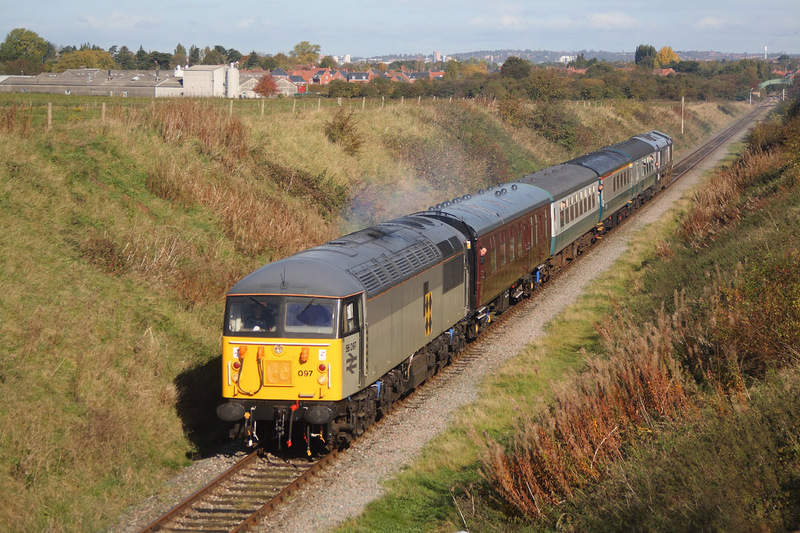 24/10/10 Great Central Railway Nottingham,Autumn Diesel Gala. 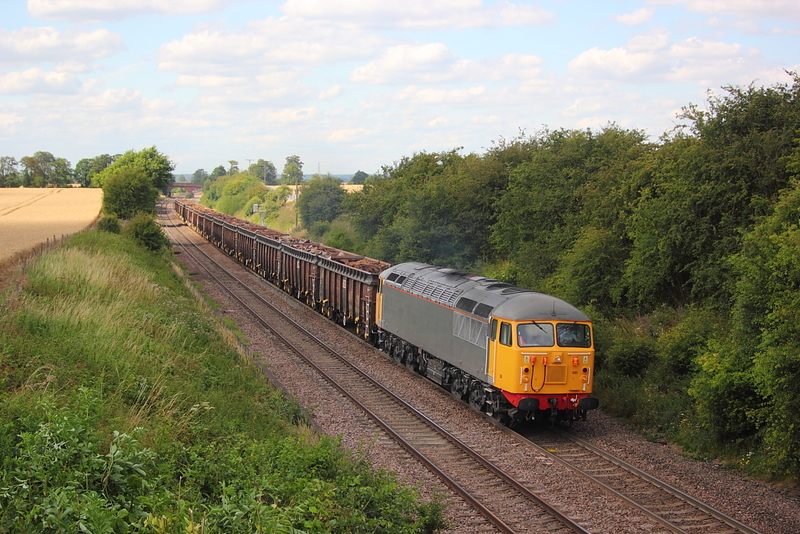 Coal sector 56097 passes Ruddington Fields Farm with 1A07,the 12.00 Ruddington to Loughborough service. 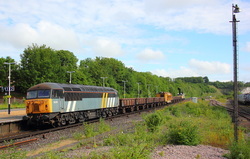 After appearing at the Mid Hants Railway's May Diesel Gala,Shackerstone Railway's 56098 headed back to the Battlefield Line,only to get as far as the M3 services at Fleet(as per image),where it stayed for a few days until it got unloaded and its bogies removed ,and reloaded to continue its journey due to some height or weight restriction .